“Darkness cannot drive out darkness: only light can do that. Hate cannot drive out hate: only love can do that.” Martin Luther King, Jr.
Every Sunday, I light two candles: one for people on my prayer list and one for peace. The prayers are always specific, but some days they are lifted up from more places than just my heart. This was one of those days – the events of this week seemed to rise up before many of us at once, begging for light. Like most people I know, this week has been one of grief and anger as we learned about the murder of nine African American women and men in their church. As we learned that they were murdered in an act of racist domestic terrorism. As we realized that, although this slaughter was unimaginably horrible, it was not surprising. Because we’ve seen so much of it lately – literally seen it captured on video and widely broadcast. There is a lot I could say about what happened in Charleston – but there are other people saying it so well whose words I’ve been sharing on social media. (And I highly recommend you check them out.) What I can add is how this event was framed for me this morning. 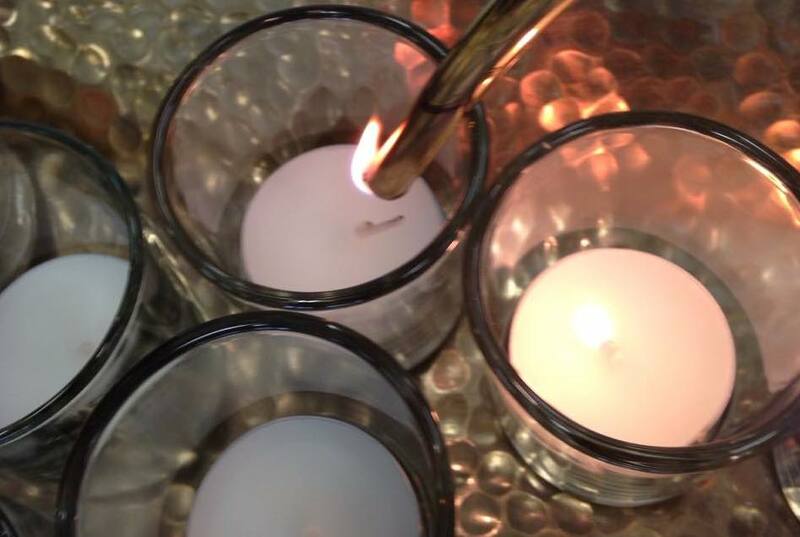 Because after I lit my candles and hoped those flames were bringing a tiny bit of light to the darkness in the world, we had a baptism in my congregation. After reflecting on the hatred we confront in the world and how faith calls us to respond, a joyful, dancing girl took vows to join in the work of helping light overcome darkness and love overcome hate. Together, a community vowed with her to resist evil, love our neighbors as ourselves, strive for justice and peace, respect the dignity of every human being. As dismal as this week (and this year and this decade) has been, it is nice to be reminded that we have reason for hope. Dismantling racism – or any kind of evil – takes a team and today a very young girl joined that team. I am betting she was joined by many others as people gathered in congregations around the country to remember the victims in Charleston. In fact, I am betting the team to confront evil got bigger where people gathered in homes and community centers and on street corners to find their roles in peace and justice-making. On days when hope seems distant and optimism feels false, it might be a candle or a splash of water or a young child reminding us that evil has not won. It might be an unexpected ally, shared bread, or the words of a song. Look for them, these reminders of hope all around us. Darkness cannot drive out darkness and hatred cannot drive out hatred. Only light and love can do that. This entry was posted in Love, Metaphor, Spirituality and tagged discipleship, faith, hope by Mary Keenan. Bookmark the permalink.